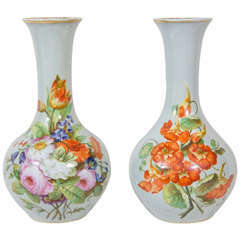 A pair of exquisite opaline vases now made into newly electrified lamps. Made in France circa 1840, during the reign of Louis Philippe, crafted from opaline glass which is smooth and white the lamps are decorated all around with beautiful roses on the stem, along with their leaves and rosebuds. Pink and red wild roses with their thorny stems intertwine with vines of blue periwinkle flowers in a pattern that was in vogue in France during the first half of the 19th century. A vivid band of “candy cane” lattichino glass tops each lamp adding a lighthearted touch. 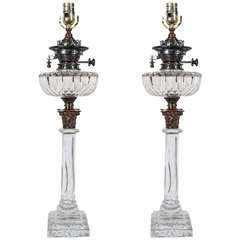 The lamps sit on bright gold ormolu bases which are decorated with golden grapes and grape leaves. Dimensions: 14.75 inches tall x 6 inches at the widest point. Condition: Excellent Price: $ 3,100 for the pair Background Opaline glass was extremely popular in France during the 19th century. Its white coloring and smooth finish allowed painters to use enamel colors which show off beautifully when applied to the translucent opaline surface. The variety of colors include pink, dusty pink, orange and a variety of greens, and blues.